i often get the question, "i'm confused, what is the difference between primitive pals and the seed pod"
another question i usually get is "what involvement does homespun peddler have with primitive pals and the seed pod?" homespun peddler's stephen and pattye kent joined primitive pals a short while after it began. they liked the group and it's concept - i loved their web site and enthusiasm for primitive stuff. the partnership just blossomed from there! in an effort to share my newsletter with a wider audience, the kents kindly offered to provide a home for the seed pod at homespun peddler. through special arrangement homespun peddler posts the copyrighted archive issues of seed pod for you to enjoy. the homespun peddler gets many questions about the photos in the seed pod gallery...such as "are these dolls for sale?" or "are these patterns?" in a few cases the images shown are patterns by the individual artists other times they are one of a kind dolls that are already sold. members of primitive pals have direct contact with the artists and we provide all the information for contacting them with regard to purchasing their work. the gallery corresponds to current newsletters that are being distributed to the club. as a bonus the general public is welcome to view the images. every effort is made to answer inquiries about gallery photos,but the best way to stay on top of the information is to actually join primitive pals. I just wanted to tell you how happy I am with the two Raggedy Anne dolls I received from my two partners. The first was "American Raggedy" from Rosetta, she is wonderful. 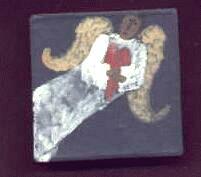 An angel Raggedy with tin wings and floss hair, her dress is made of American angel fabric and she holds a eagle in it nest. I just love her. She used floss I think for the hair and her face is so well done. My second Raggedy was from Jo Ann. Dressed in blue with red star fabrics and a red plaid apron with hearts on it . This doll has jute for hair. I received beautiful neatly worked squares from Barb down under. She used some wonderful Australian flannel and did an applique of a Joey (baby kangaroo)sewn on a small plaid print with in diamond at each crossing. Also were two basic but beautiful nine squares, one with a Teddy stenciled using the same fabric as the Joey block. I'm watching the mail box I can hardly wait to put this quilt together. Just saw a fantastic primitive garden doll Debbie Nees made. The arms were old spindles and the legs fence posts. She had four inch twigs for hair and a simple blue ticking shift. On her dress was a pocket that was embroidered "how does your garden grow". The pocket was filled with dried roses, black-eyed susans and other plant material. Hanging from her spindle arms, which stuck straight out, were more dried flowers and plants. Attached to the end of her arms were a pair of small gardening gloves. i participated in 2 swaps - primitive animal and raggedy ann. my bunny named hilda mae came from debby nees. she's great. she has an embroidered face. she is painted and then sprayed with tea. her dress is a navy homespun with a tea-dyed muslin collar embellished with a doily and a button. she carries a wreath. my raggedy ann came from cindy allison. she's painted and stained wearing a red homespun dress and a jacket that has mis-matched buttons, and a bit of lace around the collar. her leg stripes are hand painted and she carried a small sampler "a is for annie." these were too great swaps. i certainly hope my partners are as happy with their dolls as i am. I recently made a Lavender Lady......My daughters' mother in law loves lavender and purple , so I made a silly lavender lady, used an old lavender top for the body, arms and legs....it was sort of a velvety look....used a piece of lavender blouse for the head (covered with silk leaves, moss and tiny purple petals),long skinny legs and a skirt of old lavender lace with antique buttons sewed on helter skelter,holding a bouquet of lavender flowers (silk)... her name was Phoenicia, the local physic who loves to dress-up for parties and always wears shades of Lavender. My daughter insisted I bring her when I visit her in N.C.
hemostats: I have about 4 of the silly things and am lucky to find just one, when I am in need - they are all over the house !! but I can't imagine turning anything without them. Also great for when you are trying to turn under edges on small items - or pulling a needle through a really tough seam... or holding very small wood objects while painting !! too many uses to list. My dremel tool: I got one of these as a gift from my husband. having NO CLUE as to what it was, or what i was supposed to do with it... he was kind of bummed thinking I'd be ecstatic and use it for my wood items. needless to say after I tried it out and messed with it a bit - talk about taking major time off of your projects and being able to get into small places, and put an 'edging' on your wood pieces to make them more 3 dimensional. my dolls tend to be more country in style with a little primitive flair, I have always admired primitives and would enjoy trying my hand at a few. I was thinking of incorporating rubber stamping and wanted to know if this would be acceptable in primitives? I have some primitive designs that I thought I would stamp along the hem of a muslin apron for example. Easter will be here before we know it. I love eggs at Easter time. Here are a couple of egg ideas. purchase brown craft paper / 'papier mache' eggs and paint them with acrylics in dark pastel colors. When dry, decorate by painting dots and little squiggles with contrasting pastel colors. Once dry, apply brown shoe polish to darken and gives them an antique look. There is nothing like decorating real eggs with natural dyes. These eggs are not to eat, rather made to be kept for a long time and displayed year to year. Gather small leaves and flowers to lay on the egg. Hold leaves/weeds in place by wrapping tightly with a 5"cut square of nylon hosiery. Secure in the back with a twist tie. Your local florist may allow you to search their trash bin for greenery if you are unable to locate any. Boil the nylon wrapped eggs in onion skins. 2 quarts of water to 6-8 cups onion skins & 1 cup of vinegar. Add everything including eggs in the cold water and bring to a boil. Simmer for 1-4 hours depending on the desired color. The onion water can be re-used. Your local grocery's produce section may have an onion bin that you can get permission to pick through for fallen skins. Red cabbage makes wonderful blue eggs -simmer them for 6 hours. The liquid part of the egg will eventually dry up inside. Add your name and the year to each egg as it is finished and increase your collective display with each year. SILVER-GREEN: made with cranberries or fresh purple ornamental basil. Purchase whole, fresh cranberries in the winter months and freeze the package as is. Herb gardeners can cut ornamental basil (dark purple variety) before frost, place it in small plastic bags, and freeze it until needed. Place raw eggs in the bottom of pan. Place the fresh, frozen, or dried dye material on top of the eggs. Cover the eggs and the dye material with water, add 1 T. vinegar, and bring to a boil. Simmer gently 10 minutes, remove from heat and let eggs cool in the dye for about an hour. Remove eggs and place eggs in an egg carton and refrigerate. SPRING GREEN: made with tansy. Tansy is an herb that comes up early in the spring. Use it fresh if you grow it. Follow the same dyeing method as the silver-green above. ROBIN'S EGG BLUE: made with red cabbage. Save the outer leaves from a head of red cabbage. The leaves can be used fresh or can be frozen and used later. Follow the same dyeing method as the silver-green above, cooling the eggs one hour in the dye water. Then place the eggs in another container; pour the warm, drained dye water over the eggs, and let set overnight in a cool place. When the eggs are removed in the morning, they will be blue. tell jackie the primitive pals sent ya! a catalog of line drawings of barbed wire patents, identified by name, patent number and patent date and arranged by classifying attributes (e.g. 2 points, 4 points, metalic strip, etc.). This makes locating a wire sample very convenient. lots of primitive stitchery patterns. whimsical fairy tale dolls with awesome faces! poetry and verses to use for samplers etc. I Wonder? Shall grow as big as you?"